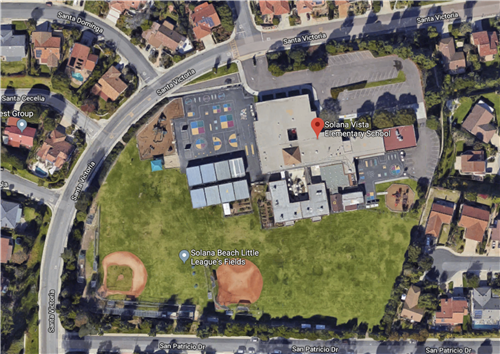 Solana Vista, a Solana Beach School District elementary school, was originally constructed in the 1970s and is being considered for modernization/reconstruction as identified in the Long Range Facilities Master Plan. The enrollment is approximately 400 students, grades K-3. The school site acreage is approximately ten (10) net usable acres. The District plans to commence construction of this facility in Spring 2020 with the desire to open the school Fall 2021/2022. The school facility will have classrooms available to house approximately 350-400 students and will include spaces for special education, library/media center, art room, music room, computer room, resource specialist area, science lab, stage/multipurpose room, office complex, teacher preparation and tutoring/pull out rooms, storage, after-school care facility, hard court play areas, bus access, parking lot(s) with parking capacity of no less then 2.25 parking spaces per teaching station, vehicle service drive, serving kitchen, refuse pickup, and other aspects of a comprehensive elementary school. The campus will contain electronic and communication capacity consistent with other District elementary schools. The buildings on the site may be compressed and may contain two-story classroom facilities with interior circulation. Interim housing will be required during the construction period. Every effort will be made to construct an environmentally friendly school with sustainability in mind. The design team is made up of stakeholders, including but not limited to, staff (certificated and classified), administrators, City of Solana Beach representatives, special education, specialty programs (STREAM, CRT, etc. ), school board members, community members, consultants. The team work together to establish priorities in design function to meet current educational standards. Presentation - Staff and the architect team will report to the Board of Education new findings from the latest community engagement meetings as well as present the Solana Vista Single-Story Schematic Site Layout requesting the Board of Education approve the Schematic Site Layout and to proceed to further develop the site plan through the Design Development phase of the project. Presentation - The attached is a presentation to the Board of Education at the regularly scheduled board meeting on January 17, 2019. The presentation includes an update since the October 2018 meeting, schematic site diagram of a partial two-story and a single story campus, and a traffic study update. The Board provided direction to further develop the single story schematic site diagram. Slides 8 and 12 are movies demonstrating the building massing - comparing a single story with a two story concept. The board directed staff to move forward on the single story concept. Staff will be returning to the Board with further design information on February 13, 2019 at the regularly scheduled board meeting. Presentation - The attached presentation was provided to the Board of Education at the regularly scheduled board meeting on October 11, 2018. The presentation includes three new site layouts for board review and direction. The board directed further development of Concept 1 - the single story site layout. The geotechnical testing performed by Placeworks was completed for the CEQA required soils review during the February break. Additional testing by Construction Testing & Engineering, Inc., will need to be performed during Spring Break 2019. The work includes the use of drilling equipment to take boring samples to assess the soil condition and compaction in various locations. Presentation - The attached presentation was provided to the community in attendance at the Community Engagement Meeting held on April 16, 2019. The presentation includes information on CEQA, Traffic and other Technical Studies that will be performed as part of the construction process. The latest site layout was also shared. See the Board Presentation posted below for the presentation that contains the 3D fly through model. Presentation - The attached presentation was provided to the Board of Education at the regularly scheduled board meeting on April 18, 2019. The presentation includes an update on Design Development, a 3D fly through model of exteriors, initial landscape design, and a tentative schedule going forward. The District and architect will continue to further develop the presented site layout. Traffic Study - The attached document is the Traffic Impact Analysis provided by the traffic engineer under the CEQA process for the Solana Vista Modernization Reconstruction Project. FAQ - The attached document is a compilation of questions and answers most frequently asked regarding the Solana Vista Modernization Reconstruction Project.